If you recently purchased a better-performing AV receiver, soundbar and 4K television, there is a good chance a significant boost in performance and convenience is heading your way soon. That’s because manufacturers including Sony, Denon and others have either recently pushed to select step-up products firmware updates carrying new HDMI Enhanced Audio Return Channel (eARC) and other HDMI 2.1 features or will very soon. More on that below. So what is eARC? It was originally introduced as one of seven core features that will be included in the upcoming HDMI 2.1 standard, but while that standard continues to await chipsets and testing protocols for implementation in commercial products (probably starting to arrive in the second half of 2019), the eARC portion can be added now to some HDMI 2.0b based devices via a firmware update, provided manufacturers have made this part of the equipment design. What this means is that the bandwidth that currently limits HDMI-ARC outputs in the connection between TVs (output) and receivers (input) will see a bandwidth boost from the previous 1 Mbps in ARC to a whopping 38 Mbps in eARC. That brings with it a host of capabilities that have remained elusive to new 4K TV and home theater audio equipment buyers wanting to listen to the benefits of some of the latest and greatest audio formats including: uncompressed Dolby True HD or DTS-HD Master Audio surround sound, 7.1-channel instead of 5.1-channel speaker channel configurations, and in some cases (depending on the implementation) Dolby Atmos and DTS:X 3D audio enhancements. The new eARC specifications also make Lip Sync Correction mandatory so that pictures and audio should match even in a multi-component daisy chain. Another eliminated trouble spot is the use of the HDMI-CEC equipment interoperability protocol, which has been notorious for compatibility failures between different brands of products. Instead, eARC uses a dedicated data channel enabling equipment to make unimpeded handshakes for device data exchanges that instantly communicate the capabilities and limitations of each connected device in a chain to deliver the best possible formats and control codes that can be passed from end to end. In short, with eARC: 1) the audio bit rate goes all the way up to 38 Mbps compared to 1 Mbps for ARC; 2) the discovery mechanism in the eARC connection uses a 2-pin signal that is much more robust and reliable so that it works every time among different brands of products; and 3) it has required lip-synch built-in so pictures always match to sound, even when shipped over multiple components. What’s more, manufacturers will no longer have to make the AV receiver or the sound bar the control hub in the system, unless desired, and those audio devices will no longer be required to handle video signals, which has created road blocks in the past when new formats like high dynamic range (HDR) video profiles were introduced. Further, eARC will allow the same high quality signals to be sent both downstream and upstream between the television and audio component, unlike today’s narrow band ARC. For years, such limitations have created nightmares for consumers, installers and manufacturers alike, generating complaints and trouble-shooting workarounds to make new AV gear perform as advertised. The connected products also must be set to automatically install firmware updates when available. A Sound United representative told us that Denon will be pushing its previously announced eARC firmware updates on Oct. 31, 2018. Denon previously announced that it plans to add eARC capabilities to its 2017 AVR-X3400, AVR-X6400H and AVR-X8500H audio video receivers. The feature will also be supported in new 2018 models AVR-X3500H/X4500H/X6500H. Most of these will have this activated once the Oct. 31st firmware update is activated and receiver is connected to an eARC-supporting television. Meanwhile, Yamaha said its previously announced eARC supporting products will receive firmware updates to activate the feature “by the end of the year.” No exact timing is yet available. Both the 2018 and 2017 Yamaha AV receiver models in the RX-V 85/83 and RX-A 80/70 series, and models RX-S602 and CX-A5200 will support eARC via the firmware update, the company said. In addition to the RX-V and RX-A models above, the RX-S602 and CX-A5200 would also be included in the list of supported models. Similarly, Onkyo has said it is planning to support its AVR model TX-RZ920 with a future firmware update bringing eARC. As for other TV manufacturers, Samsung said it has not announced plans to implement eARC at this time, while LG did not get back to us with an answer on the status of its plans as this was posted. Meanwhile, Hisense is mulling an update to bring select HDMI 2.1 features to unspecified models but has not yet determined an ETA to bring them to products. Other manufacturers and products will undoubtedly follow. Eventually, eARC features and other next-level features will be included in the very robust HDMI 2.1 specification. According to industry sources: it appears right now that supporting chipsets will become available around March 2019; subsequently, the products with full support for true 2.1 probably won’t hit shelves until the second half of 2019 or 2020. In part, this is because the HDMI 2.1 spec is forward looking and the industry infrastructure won’t yet support enhancements like 4K/120fps, 8K/60fps or 10K resolutions that are built into the new interface. However, certain other enhancements beyond eARC that are part of HDMI 2.1 will also be supported selectively by some products with HDMI 2.0b ports from some manufacturers. These enhancements include: Quick Frame Transport (QFT), which reduces latency for smoother no-lag gaming, and real-time interactive virtual reality; Quick Media Switching (QMS) for movies and video which eliminates the delay that can result in blank screens before content is displayed; and, perhaps, Variable Refresh Rate (VRR) and Auto Low Latency Mode (ALLM for Xbox games), depending on the product’s architecture. Any early implementation of HDMI 2.1 enhancement, of course, would not include support for the full 48Gbps data rate on 2.1; as 2.0b is limited to 18Gbps. So what do we call these partially HDMI 2.1 updated products? “I’ve heard the term `HDMI 2.1 Compatible’ floating around but my understanding of what HDMI.org has published is that anyone implementing 2.1 features without full 2.1 support will have to use the term `HDMI 2.0b with 2.1 eARC for example,” Porter speculated to us. 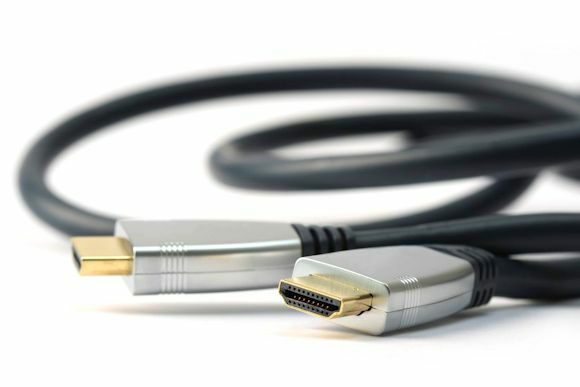 Meanwhile, we were told a few of unnamed flagship AVRs and televisions are now shipping with the HDMI 2.0b ports in a ‘module’ that could be upgraded when HDMI 2.1 is made commercially available. Stay tuned.